The 2019 Toyota Avalon Hybrid launches in May at a time the big sedan market and the hybrid market both are in trouble. But with the Avalon, Toyota has a chance to boost its presence in the shrinking big car segment and increase its dominance in the moribund hybrid space. The five-passenger sedan is re-engineered and redesigned for the 2019 model year, and the engineers and designers did a nice job of it. Perched on a new platform that also underpins the Camry, C-HR and Prius, the 2019 Toyota Avalon Hybrid, like its gas-only siblings, is quicker, more responsive, more sure-footed and more comfortable than its predecessor. The hybrid gets a substantial 10 percent fuel efficiency boost over the 20198 version, for an EPA estimated 44 mpg combined city-highway rating. Not bad for a big sedan. Non-hybrid models have a 301-horsepower V6 and 8-speed automatic while the hybrid gets a new 2.5-liter 4-cylinder gas engine coupled with two electric motor-generators and an electronic CVT. The 2019 Lexus ES hybrid sedan, due in showrooms in September, shares the the Avalon hybrids’ powertrain, fuel efficency ratings, underpinnings and much of its sheetmetal. 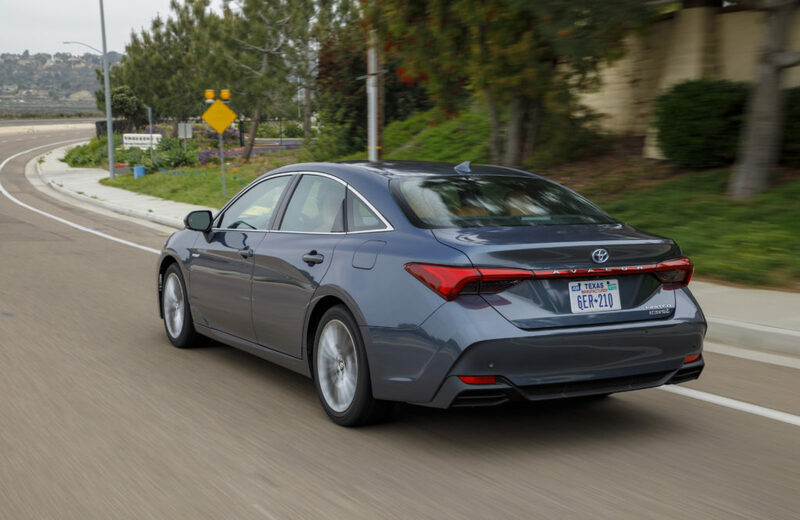 The average Avalon buyer is 66 – two years older than the segment average of 64 – and Toyota hopes that the 2019 version will bring a younger buyer into the fold without alienating the core audience. To that end, it has blended improved performance with comfort, added technology upgrades that won’t befuddle most users and modernized the interior and exterior to attract previously Avalon-averse customers without doing much of anything that would upset its core audience. TheGreenCarGuy had an opportunity at a recent Avalon press event to sample both and, green-car bias aside, preferred the hybrid’s handling. One big improvement in all Avalon models over 2018 is the addition of a new multi-link independent rear suspension. 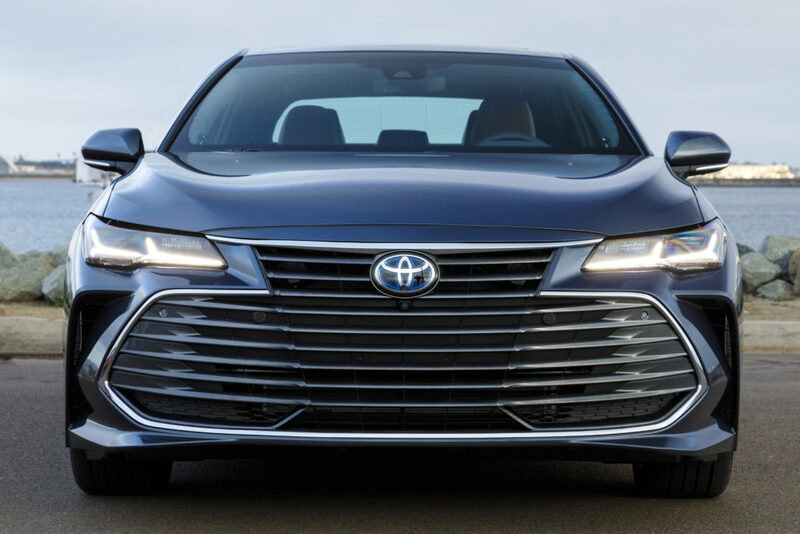 On the looks side, the only potential flaw is the 2019 Toyota Avalon’s gaping maw. Toyota not only adopted the massive “cow-catcher” grille styling it has introduced on other new models recently but expanded it into Lexus-like proportions for the Avalon, and added narrow side intakes as well. Thankfully the scoops are functional, reducing front-end wind resistance and funneling cooling air to the front brakes. Offsetting the front view is what has to be one of the most pleasing sedan profiles in years. The designers managed to pull together all the elements – curves, character lines, tire to wheel-well proportions and hood, trunk and roof lines – for a smooth, unified, sporty and, yes, slightly sensuous look. The 2019 Toyota Avalon Hybrid, along with the gas-only versions – is longer, lower, wider and a tad roomier than its predecessor, with a wider stance and longer wheelbase for less front and rear overhang. The only visual differences between hybrid and standard versions of the 2019 Avalon are the hybrids’ badges and exhaust treatment – the hybrid gets a single, hidden exhaust outlet while the gas-only versions get multiple chromed exhaust tips. Sharp-eyed observers might also notice that the hybrid’s grille hides active air intake shutters that close for increased aerodynamics when the electric drive is working and the gas engine doesn’t need the extra cooling. 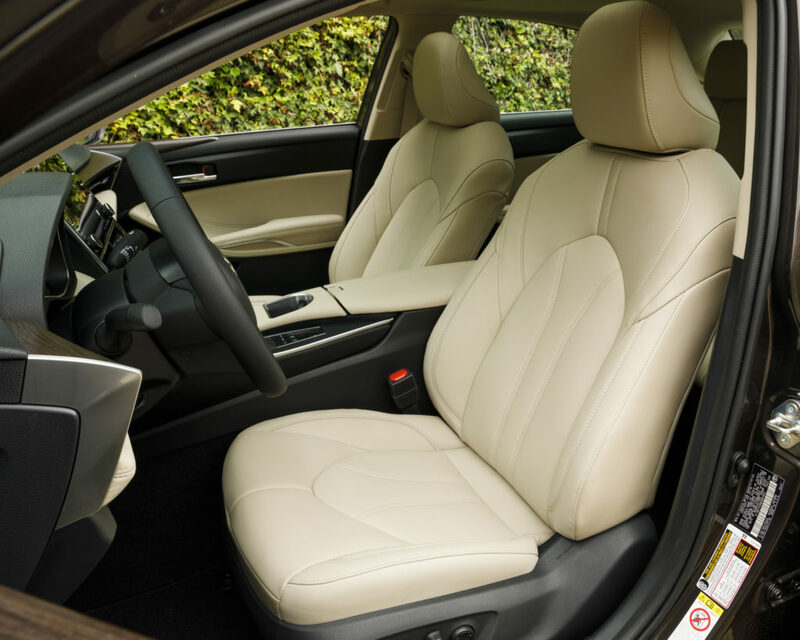 The 2019 Avalon hybrid also benefits from the relocation of the hybrid battery to beneath the floor from its previous position behind the rear seats. The new design gives the hybrid the same trunk size – 16.09 cubic feet – as the standard model. That’s up from 14 cubic feet in the 2018 Avalon hybrid. In all, Toyota’s done good with the 2019 Avalon, which comes in three hybrid and four gasoline-only trims. From here on, it’s all about the hybrid. 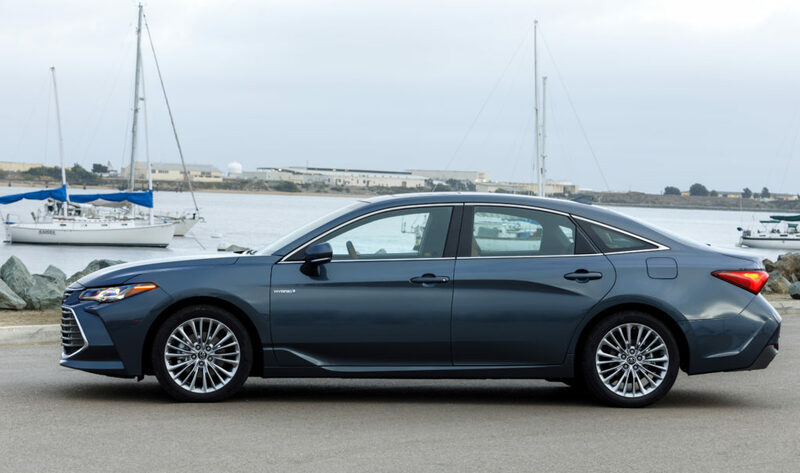 The 2019 Toyota Avalon Hybrid carries a scant $1,000 premium over the standard models, with prices starting at $37,350 – including handling and delivery – for the base XLE HV (hybrid vehicle) trim. That’s an impressive $1,000 less than the 2018 LXE Plus hybrid. In the mid-range sport version, the 2019 Avalon XSE HV starts at $39,000, while the top-of-the-line Limited HV, starts at $42,800. 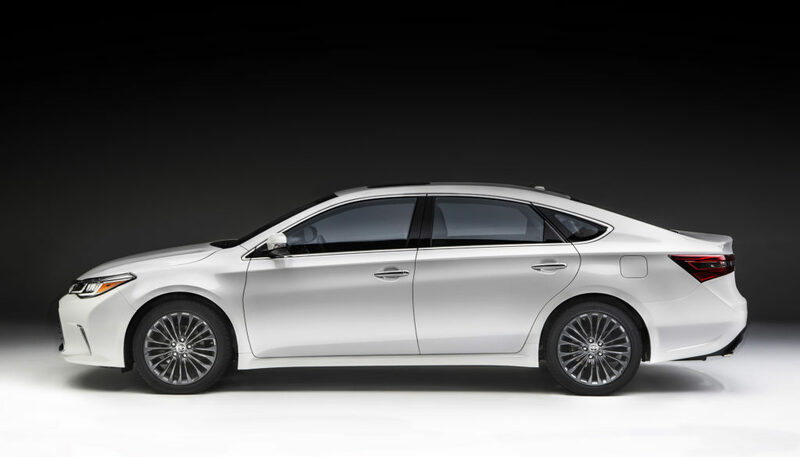 2019 Avalon redesign displays character the 2018 (below) can’t match. 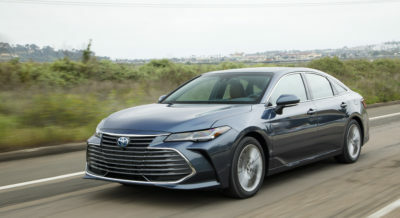 While slightly heavier and a tad slower to accelerate on straightaways than corresponding all-gas versions, the 2019 Toyota Avalon Hybrid in each of its three trim levels was noticeably more nimble than on corners and curvy roads, where driving still can be a pleasure rather than a chore. The hybrid system produces a peak 215 horsepower, 86 fewer ponies than the V6 standard models, but its packaging seems to provide better weight distribution than the gas-only versions, with the hybrid battery placed under the floor to give the Avalon hybrids a nice low, road-hugging center of gravity. There is some body roll at speed when cornering and on rough stretches of road the suspension transmitted some of the bumpiness into the cabin, but overall ride quality was always pleasant and comfortable. 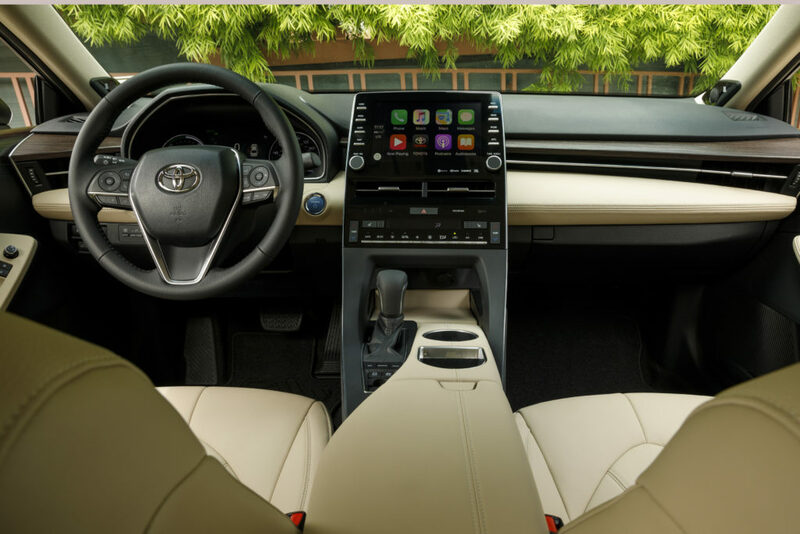 Toyota was lavish with noise dampening materials so the interior is quite quiet, even when the 2019 Avalon hybrid is running in all-electric mode – something it can do for very short periods and low speeds when the small hybrid battery is fully charged. Because of slight weight and equipment differences, the Avalon hybrids get two slightly different fuel efficiency ratings from the EPA. The base 2019 Avalon XLE hybrid is rated at 43 mpg city, 44 mpg highway and 44 mg combined. The Avalon XSE and Avalon Limited hybrids are rated at 43 mpg across the board – city, highway and combined. All Avalon hybrids use unleaded regular gasoline. All 2019 Toyota Avalon hybrids come with blind spot monitoring, rear cross-traffic alert and Toyota’s Safety Sense P and Star Safety systems. Safety Sense P includes Toyota’s pre-collision system with pedestrian detection, lane departure alert with steering assist, automatic high beams and dynamic radar cruise control. Star Safety includes stability and traction control, 4-wheel anti-lock braking with electronic brake force distribution, braking assist and Smart Stop, a system that overrides the accelerator and stops the car when both brake and accelerator are applied at the same time. All three Avalon hybrids get Toyota’s newest hybrid system. It couples a 2.5-liter 4-cylinder gas engine with a pair of electric motor generators and delivers power to the wheels via an electronic continuously variable transmission, or CVT. The gas engine can produce 176 horsepower and 163 lb-ft or torque at peak output; the electric drive system produces 118 horsepower at peak and the combined output of the two systems working in tandem is 215 horsepower. Toyota’s hybrid system uses one of the motor generators as the starter motor, generator and to charge the nickel-metal hydride battery. The second motor generator drives the front wheels – sometimes alone and sometimes in tandem with the gas engine – and generates power during braking that’s used to help charge the hybrid battery. The system provides four driver-selectable power modes. Three of them – Eco, Normal and Sport – alter accelerator pedal and steering input response. The fourth, EV mode, locks the system into electric drive when there is sufficient power in the hybrid battery. Typically, the 2019 Toyota Avalon Hybrid with a fully charged battery can travel in EV mode for no more than a few miles at speeds of up to 25 mph. The base 2019 Toyota Avalon Hybrid is the XLE. It comes with 17-inch low rolling resistance tires an alloy wheels, LED headlamps, taillights and daytime running lamps, heated manually adjustable side mirrors with integrated turn signal and blind-spot warning indicators. Interior features include dual-zone climate control system with rear seat vents, backup camera, tilting and telescoping leather-wrapped steering wheel with integrated audio and infotainment system controls; synthetic leather and fabric seating; heated, eight-way power adjustable front seats; 60/40 split folding rear seats, and Toyota’s Entune Plus 3.0 audio system with 8-speakers, a 9-inch touchscreen, USB 2.0 port, iPod connectivity, voice recognition, Bluetooth, satellite radio capability, Apple CarPlay and Scout GPS compatibility, free Entune App suite access, Toyota safety and service connect with three-year free trial subscriptions, Toyota remote connect with three-month complimentary subscription and Verizon WiFi Connect with a six-month free subscription. It is also worth considering the safety of the Avalon, Common Neck and Back injuries from Car Accidents are something to consider when buying a new car. You want to make sure that the ergonomics of the seating line up with you well to avoid additional damage during an accident. Sacramento personal injury law firm are worth looking into. A friend recommended I get a free consultation and they were really helpful, talking me through the process if I were unfortunate enough to become involved in a car accident and develop neck and back injuries. Toyota updated the 2019 Avalon Hybird’s interior to emphasize technology and luxury, but didn’t go full-Tesla, leaving functioning switches and knobs for key functions. The Avalon XSE trim adds 18-inch tires and dark gray painted alloy wheels; specially designed headlights and taillights; a Qi wireless charging for smartphones and other Qi-compatible electronic equipment. Unique to the XSE trim level are ultra-suede seat inserts; paddle shifters; aluminum interior trim; and a piano black grille surround with mesh insert, piano black rear spoiler and piano black mirror caps, rear diffuser and badges. The Avalon Limited hybrid adds low profile 18-inch tires with chrome-plated alloy wheels; power side mirrors; power moon roof; leather seating; a front seat memory system; heated and coled frnt seats, a heated steering wheel without paddle shifters; 10-inch color head-up display with customizable settings; heated rear seats; wood interior trim, and the Entune 3.0 Premium JBL audio system with 14 speakers and real-time navigation with a three-year subscription. There are two options packages for the XLE hybrid: a JBL audio upgrade and a power moon roof package that includes Qi wireless charging. The XSE hybrid has one package, the JBL upgrade. The Avalon Limited hybrid also has a single option, the advanced safety package that includes a bird’s eye view camera for a 360-degree view around the car, and “intelligent sonar clearance” obstacle sensing and alert with rear cross-traffic braking. If luxury appointments aren’t all that important, the Ford Fusion, Kia Optima and Hyundai Sonata hybrids, all with 2.0 liter engines and 42 mpg (combined) fuel effiiciency ratings are worth looking at. The Hyundai and Kia hybrid sedans have slightly more passenger space than the Avalon – we’re talking a few cubic feet – while the Ford is several cubic feet smaller. All have smaller trunks than the 2019 Avalon Hybrid. To facilitate this report, TheGreenCarGuy attended an event at which Toyota provided meals and accommodations.